Please see additional news items found below. He said Al Qaeda had given hallucinogenic drugs to youth in Libya to get them to incite unrest. Libyan leader Muammar Gaddafi has blamed Osama bin Laden and Al Qaeda for inciting anti-government protests wracking in his country. In a Thursday speech relayed to state television by telephone, he said Qaeda forces had given "hallucinogenic" drugs to youth in Libya — "in their coffee with milk, like Nescafe" — to get them to incite unrest. Directly addressing the people of Zawiya, the city just outside Tripoli where his forces earlier in the day shelled a mosque sheltering anti-government protesters, he said: "Shame on you, people of Zawiya, control your children." "They are loyal to bin Laden," he said, referring to those involved in the uprising. "What do you have to do with bin Laden, people of Zawiya? They are exploiting young people ... I insist it is bin Laden." He added that people "with any brains" would not take part in the demonstrations. Independent news reports do not link Al Qaeda to the uprising. Forces loyal to Gaddafi were fighting fiercely Thursday to regain control of the country. Army units and militiamen struck back against rebelling Libyans who have wrested control of cities close to the capital. .Anti-government forces on Wednesday claimed to have taken control of the country's third largest city, Misrata, about 125 miles east of Tripoli. Gadhafi's son Seif al-Islam Gaddafi, meanwhile, claimed Thursday that the number of people killed by government crackdowns on protesters had been exaggerated, according to Voice of America. Human rights groups say they have confirmed about 300 deaths. But witnesses suggest the number is far larger, and Italian Foreign Minister Franco Frattini said Wednesday that more than 1,000 people had likely been killed in Libya's week-long uprising. In what was his second national address since the protests erupted, Gaddafi expressed his condolences for those killed and said that he had become a "symbolic" leader who had no authority to impose rules on Libyans. LONDON (Reuters) - A group linked to al Qaeda has called on Saudis to oust Saudi Arabia's ruling family and threatened attacks against the kingdom, a group that monitors Islamist websites said on Friday. The Brigades of Abdullah Azzam said the ruling family deserved to be toppled because of its extravagant spending, ignorance of the needs of the people, "collusion" with the United States and failure to allow Saudis to benefit from the country's oil revenues, the Site Intelligence Group said. "The regime of al-Saud should know that our war with them will happen for as long as they maintain their disbelief, oppression, mightiness and belligerence against the religion of the Almighty, and that the heads of this regime and its henchmen are legitimate targets for the mujahideen," SITE quoted the statement as saying. Protests against poverty, corruption and oppression have raged across the Arab world for weeks, toppling entrenched leaders in Egypt and Tunisia and spreading to Bahrain, linked to Saudi Arabia -- the world's top oil exporter -- by a causeway. Hundreds of people have backed a call on Facebook for a "day of rage" in Saudi Arabia on March 11 to demand an elected ruler, greater freedom for women and the release of political prisoners. The statement by the Brigades of Abdullah Azzam praised the ousting of the Tunisian and Egyptian presidents. "The regime of Saud is on top of the Arab regimes in terms of disbelief and in terms of fighting the religion of Allah, allying with the unbelievers, spoiling the people, plundering and oppressing them, and preventing them from having their legal rights," said the statement. The group said in August that one of its suicide bombers attacked a Japanese supertanker in the Strait of Hormuz. In 2005, a group using the same name said it carried out deadly bombings at the Egyptian resort of Sharm el-Sheikh and claimed responsibility for firing rockets at two U.S. warships in Jordan's Aqaba port. Saudi Arabia, the world's largest oil producer and the regional domino whose fall the West fears most, yesterday announced that it would ban all protests and marches. The move – the stick to match the carrot of benefits worth $37bn (£23bn) recently offered citizens in an effort to stave off the unrest that has overtaken nearby states – comes before a "day of rage" threatened for this Friday by opponents of the regime. The Saudi Interior Ministry said the kingdom has banned all demonstrations because they contradict Islamic laws and social values. The ministry said some people have tried to get around the law to "achieve illegitimate aims" and it warned that security forces were authorised to act against violators. By way of emphasis, a statement broadcast on Saudi television said the authorities would "use all measures" to prevent any attempt to disrupt public order. Already, as The Independent reported yesterday, the ruling House of Saud had drafted security forces, possibly numbering up to 10,000, into the north-eastern provinces. These areas, home to most of the country's Shia Muslim minority, have been the scenes of small demonstrations in recent weeks by protesters calling for the release of prisoners who they say are being held without trial. Saudi Shias also complain that they find it much harder to get senior government jobs and benefits than other citizens. Not only are the Shia areas close to Bahrain, scene of some potent unrest in recent weeks, but they are also where most of the Saudi oil fields lie. More than two million Shias are thought to live there, and in recent years they have increasingly practised their own religious rites thanks to the Saudi king's reforms. But the day of protest called for this Friday was – perhaps still is – likely to attract more than restive Shias in the east. There have been growing murmurs of discontent in recent weeks; protesters have not only been much emboldened by the success of popular uprisings in Tunisia and Egypt, but online channels of communication by those contemplating rebellion have been established. Some estimates indicate that as many as 20,000 were planning to protest in Riyadh, as well as in the east, on Friday. The jitters of the Saudi regime will be at least equalled in many parts of the world where sympathy for democracy movements is tempered by a reliance on petrol, which most people – for all the special pleading of the haulage industry – can just about afford. Saudi Arabia sits on a fifth of the world's oil reserves. The past week, with conflict disrupting all but a trickle of Libya's oil production, has seen the Brent barrel price climb to $103, with UK pump prices swiftly going up to £1.30 a litre. The rise in the price per barrel was caused not just by the Libyan strife – the country produces only 2 per cent of the planet's oil needs – but also by the prospect of further unrest in the region, although not the threat of full-scale breakdown in Saudi Arabia. Yesterday, alarmist voices were not slow to exploit fears. Alan Duncan, an international aid minister and a former oil trader, raised the prospect in an interview with The Times of the price of crude rising well beyond 2008's record of $140 a barrel, to $200 or more. "Do you want to be paying £4 a litre for petrol?" he asked. "I've been saying in government for two months that if this does go wrong, £1.30 at the pump could look like luxury." He outlined a "worst-case scenario" in which serious regional upheaval could propel the price to $250 a barrel, and thence to British drivers paying £2.03 a litre. London is now considering not imposing the planned 1p rise in fuel duty. CAIRO, Jan. 29 — For Gamal Hassanein, it began with a slap. The unemployed 24-year-old was arguing with a police officer when the man struck him across the face — a blow that seemed to sting for months. "He stole my dignity with that slap," said Hassanein, who does odd jobs to make money. "We could never stand up to those officers before because we were afraid. But we're no longer willing to be silenced by our fear." The tens of thousands of protesters who have thrown Egypt's 30-year-old regime into tumult come from all walks of life — conservative Muslims and Christians, yuppies and the unemployed, young and old. For many, the protests demanding that President Hosni Mubarak step down were a catalyst for years or decades of repressed anger at mistreatment at the hands of the state. One after another, they describe a moment buried in their memory that came gushing to the surface as they saw others taking to the streets. Hossam, a 23-year-old Cairo resident from the upper-middle-class Maadi neighborhood, said he thought of his cousin, who drowned seven years ago after falling out of a pedal-boat on the coast. Emergency services did not respond to a call for rescue after learning that the victim was not a Westerner, said Hossam, who declined to provide his last name for fear of official retaliation. "Why are we treated like this?" he asked. "We will get rid of this regime." The personal humiliations are exacerbated by a sense of national shame at a series of failures that throw into relief Egypt's slide from cultural and political trendsetter of the Arab world to a country besieged by poverty, illiteracy, corruption and official incompetence. A ship sinking in the Red Sea left more than 1,000 dead. The national football team lost a World Cup game to Algeria. The government has failed to reconcile warring Palestinian factions, and appears unable to influence Israel's actions in the Middle East. For years, though, the anger had no outlet. Egypt's traditional opposition groups — socialists, liberals and Arab nationalists — have been marginalized by Mubarak's years of restricting their freedom while buying their cooperation with parliament seats and other patronage. The largest and most organized opposition group, the banned Muslim Brotherhood, has not reached out to non-conservative Muslims, limiting its base of supporters. The return of Nobel Prize laureate Mohamed ElBaradei to Egypt in February 2010 energized many young Egyptians, who called on him to run as president. But his appeal was limited by his image as a secular expatriate. In June, the death of 28-year-old businessman Khaled Said at the hands of undercover police set off months of small protests that swelled into mass outrage after demonstrators grew emboldened by Tunisians' overthrow this month of their longtime autocratic president. "It is a process brewing for several years," said Hossam al-Hamalawi, a 33-year old blogger. "Activists from small groups have been agitating for these days of anger ... but no one can claim it." Mahmoud Elhetta, who leads a campaign supporting ElBaradei for president, said his group of 1,500 activists had been training for organizing civil disobedience and large protests. "We each had our tools and we were waiting for this moment," Elhetta said. Women dressed in black all-engulfing veils and wide flowing black robes followed others with expensive hairstyles, tight jeans and name-brand sunglasses. "The people want to change the regime!" they shouted, a staccato Arabic chant that first appeared in Tunisian protests. Aya Barada, a 25-year-old legal consultant wearing a blue headscarf and tight jeans, said she learned about the protests from Facebook, and relentless campaigning by activists who used Said's death as a rallying cry against the government. "I am making good money. I personally am not suffering. But the conditions in Egypt are ... bad for me, my family, and ultimately my country." Homemaker Sadat Abdel Salam wore a black abaya, or robe, and a face-covering veil to the protest. "They are taking us lightly and they don't feel our frustration," she said. "This is a uprising of the people and we will not shut up again." PARIS, (AFP) - Moammar Gadhafi said he wanted the United Nations or the African Union to probe the unrest rocking Libya and promised investigators free access, in an interview published Sunday. The strongman, making his first such demand since the outbreak of violent protests against his rule and the ensuing bloody riposte, also warned that the unrest would spell disaster for Europe. "First of all I would like that an investigatory commission of the United Nations or the African Union comes here to Libya," he told the French weekly Le Journal du Dimanche. "We will let this panel work unhampered," he said, adding that he would be in favour of France "coordinating and leading" the probe body. Shortly after the unrest broke out, Gadhafi’s son Saif al-Islam, long seen as a possible successor, said he wanted an independent domestic probe into the unrest. On February 22, the UN High Commissioner for Refugees Navi Pillay also called for an independent international investigation and an immediate halt to serious abuses committed by Libyan authorities. Gadhafi underscored that the violence posing the greatest challenge to his more than four decade rule would have serious repercussions for Europe, which has been facing an uphill battle to stem clandestine immigration, especially from North Africa and Asia. "Thousands of people from Libya will invade Europe," he said, "and there will be no-one to stop them." Gadhafi repeated an oft-repeated charge that the revolt against his regime was being spearheaded by Al-Qaeda. "There is an Islamic jihad facing you from the Mediterranean," he said. (Osama) Bin Laden will install himself in North Africa... You will have Bin Laden at your gates. "They will attack the US Sixth Fleet. There will be acts of piracy here at your gates, about 50 kilometres (30 miles) from your borders. Bin Laden’s men will demand ransom from land and sea. This will really become an international crisis." Gadhafi also said three Dutch soldiers captured during an unauthorised rescue mission were being held prisoner and underlined that this was "normal." The three were taken captive in Sirte in the north of Libya on Sunday in a botched attempt to evacuate two civilians, a Dutch engineer and one other European, by navy helicopter. SANAA, Yemen – The Yemeni government escalated its efforts to stop mass protests calling for the president's ouster on Tuesday, with soldiers firing rubber bullets and tear gas at students camped at a university in the capital in a raid that left at least 98 people wounded, officials said. The army stormed the Sanaa University campus hours after thousands of inmates rioted at the central prison in the capital, taking a dozen guards hostage and calling for President Ali Abdullah Saleh to step down. At least one prisoner was killed and 80 people were wounded as the guards fought to control the situation, police said. Yemen has been rocked by weeks of protests against Saleh, inspired by recent uprisings in Egypt and Tunisia that drove out those nations' leaders. Saleh, a key U.S. ally in the campaign against al-Qaida, has been in power 32 years. In a sign that the protests are gaining traction, graffiti calling for Saleh to step down surfaced Tuesday in his birthplace, village of Sanhan, for the first time since the protests began. Students at Sanaa University have been sleeping on campus since mid-February, shortly after the start of the protests calling for the country's president to step down. Medical officials said many of the 98 people wounded were in serious condition. The officials spoke on condition of anonymity because they weren't authorized to release the information. Witnesses reported seeing armored vehicles and personnel carriers headed to the area of the university. "It's a massacre," said opposition spokesman Muhammad Qahtan. "It is a crime by security troops against students engaged in a peaceful sit-in." Demonstrations also continued elsewhere in the country. In the southern port city of Aden, a crowd of women joined a demonstration after a young protester was shot in the head and critically wounded during a rally there the previous day. Tens of thousands took to the streets in the Ibb province, calling on the government to bring to justice those responsible for a deadly attack there Sunday. Opposition activists blamed "government thugs" who descended on protesters camped out on a main square. One person was killed in that violence and 53 people were hurt. Even before Yemen was hit by the wave of protests, the country was growing increasingly chaotic with a resurgent al-Qaida, a separatist movement in the south and a Shiite rebellion occasionally flaring in the north. Seeking to head off the protests, Saleh called for national dialogue after meetings Monday with the country's top political and security chiefs. The state-run news agency said the conference would be held Thursday and would include thousands of representatives from across Yemen's political spectrum. But opposition leader Yassin Said Numan said there would be no dialogue unless Saleh agreed to step down by year's end. Saleh's recent pledge not to run for re-election in 2013 has failed to quell the protests. The unrest at the prison started late Monday when inmates set their blankets and mattresses ablaze and occupied the facility's main courtyard, a security official said. Prison guards fired tear gas and gunshots in the air but failed to subdue the rioters, the security official said, speaking on condition of anonymity because he was not supposed to talk to the media. The prison revolt was still going on Tuesday afternoon, he said. Residents close to the prison reported hearing gunfire and blasts and said troops were bringing in military reinforcements. Abdelrahman Burman, a lawyer who heads a human rights organization called "Sajin" — Arabic for prisoner — said at least one inmate was killed by a bullet fired by riot police and more than 80 people were wounded, including 20 policemen and prison guards. He said about half of the wounded were shot and the rest suffered breathing problems and fainting because of the tear gas. A police official confirmed the casualty numbers. He spoke on condition of anonymity because of the sensitivity of the situation. A top Libyan al-Qaida commander has urged his countrymen to overthrow Moammar Gadhafi's regime and establish Islamic rule, expanding the terror network's attempts to capitalize on the wave of unrest sweeping the region. Abu Yahia al-Libi, al-Qaida's Afghanistan commander, said in a video posted on a militant website that after the fall of the regimes in Tunisia and Egypt, it is now Gadhafi's turn, as rebel fighters there press a nearly monthlong campaign to oust him. Those nation's autocratic governments — enemies of Islamic militants — practiced "the worst kind of oppression" with the backing of the West and had failed to heed the lessons of history, he said. "Now it is the turn of Gadhafi after he made the people of Libya suffer for more than 40 years," he said, adding that it would bring shame to the Libyan people if the strongman were allowed to die a peaceful death. A transcript of the video was provided Sunday by SITE Intelligence Group, a U.S. organization that monitors militant messages. Gadhafi has accused al-Qaida of being behind the movement seeking to end his more than 40-year rule, though the rebels have no known links to the terrorist organization. The uprisings in Egypt and Tunisia were similarly driven by widespread popular outrage at corruption, unemployment and limited outlets for political expression, rather than Islamist fervor. Nevertheless, al-Qaida has tried to make gains on the tumult, also urging formation of an Islamic government in Egypt. Libya's Gadhafi was once demonized for sponsoring various terrorist groups and attacks like the 1988 Pan Am bombing over Lockerbie, Scotland. But in the late 1990s, the Libyan leader began efforts to emerge from international pariah status and stopped sheltering terrorists. Gadhafi also crushed his country's Muslim militants, including those who fought in Afghanistan alongside Osama bin Laden, and banned clergymen from expressing political opinions in their Friday sermons. Gadhafi has also helped the U.S. track al-Qaida and other terrorism suspects in the region. Since then, top al-Qaida figures have routinely targeted him in their video and audio recordings. Al-Libi said ousting Western-backed Arab regimes was "a step to reach the goal of every Muslim, which is to make the word of Allah the highest" and establish Islamic rule. The al-Qaida commander, whose nom de guerre is Arabic for "the Libyan," rose to prominence in the terror group after escaping from the U.S. military prison at the Bagram Air Base in Afghanistan in 2005. He is believed by Western and Afghan intelligence to have run training camps for suicide bombers and fighters in eastern Afghanistan along the border with Pakistan. Afghan police said at the time of his escape that his real name is Abulbakar Mohammed Hassan and that he is a Libyan. The authenticity of his 31-minute video could not be verified, but it was produced by As-Sahab, the media wing of al-Qaida, and posted late Saturday on militant websites. He also criticized the United States, asking how it could ultimately voice support for the uprisings after having backed the regimes they toppled. "We have to get rid of our inferiority complex and free ourselves from the West," he said. His message came days after a North African offshoot of al-Qaida called on Muslims to support the uprising. Al-Qaida in the Islamic Maghreb said in a statement posted on a militant website last month that it would do whatever it can to support the revolt against Gadhafi, calling him a "criminal tyrant," but it gave no specifics. The group, based in neighboring Algeria, may be seeking to capitalize on the revolt to gain recruits or win support among Libyans. Milan (Italy), March 15 (DPA) Libyan leader Muammar Gaddafi Tuesday ruled out negotiations with anti-government rebels, whom he described as 'terrorists linked to Osama bin Laden', but warned that if the West were to attack his country, he would ally his forces with Al Qaeda in a 'holy war'. Gaddafi made the remarks in an interview with Milan-based daily Il Giornale from his headquarters in the Libyan capital Tripoli. However, 'if they (the West) behave with us as they did in Iraq, then Libya will leave the international alliance against terrorism'. 'We will then ally ourselves with Al Qaeda and declare a holy war,' Gaddafi said. Gaddafi had previously accused anti-government rebels and their leaders of being 'hostages' of Al Qaeda and warned that no dialogue with them was possible. 'They (the rebels) don't have any hope. Their cause is lost. They only have two possibilities: to surrender or to flee,' Gaddafi said. He also accused the rebels of 'using civilians, including women, as human shields'. Gaddafi said his troops would continue besieging rebel hold-outs, including Libya's third-largest city, Misurata, because this is what 'the people who are on my side' want. 'The terrorists will be put on trial, but normal citizens who have been misled will be pardoned. There will be clemency for those who put down their weapons,' Gaddafi said. The Libyan leader also said he felt betrayed by Western leaders like Italian Prime Minister Silvio Berlusconi and described French President Nicolas Sarkozy as 'mentally disturbed' for proposing air strikes against his forces. 'I am totally shocked, I feel betrayed and I wouldn't know what to say to Berlusconi,' Gaddafi told Il Giornale, which is part of Berlusconi's media empire. Last year, Berlusconi treated Gaddafi to a lavish reception in Rome to mark a friendship agreement between their two nations. But the Italian leader has recently joined his European colleagues in condemning the actions of Libyan government forces. Gaddafi also indicated that certain oil and gas contracts involving Libya and several Western companies, such as Italy's state-controlled energy giant ENI, would be reviewed once the rebellion had been quashed. 'I think and I hope that the Libyan people will reconsider the economic, financial and security ties with the West,' Gaddafi said. SANAA (Reuters) – Yemen's President Ali Abdullah Saleh said on Saturday he was prepared to step down if allowed a dignified departure, but the opposition accused him of maneuvering to hold on to power. Earlier Foreign Minister Abubakr al-Qirbi told Reuters a deal to transfer power peacefully could emerge shortly based on an offer by Saleh to quit by the end of the year. But a deal did not appear imminent since government opponents had hardened their demands. "I could leave power ... even in a few hours, on condition of maintaining dignity and prestige," Saleh told Al Arabiya TV, adding that he would remain in charge of the ruling party even if stood down. "I have to take the country to safe shores ... I'm holding on to power in order to hand it over peaceably ... I'm not looking for a home in Jeddah or Paris." Yemen, a poor and tribally divided country, that has become a base for al Qaeda next to the world's top oil producer Saudi Arabia, has been in upheaval since January when the example of the Tunisian and Egyptian revolutions set off popular demonstrations to end Saleh's 32-year rule. Talks have been under way on two tracks to hash out the details of a deal on a peaceful transition of power. But the leader of Yemen's opposition coalition said the sides still had significant differences, and that while there were some contacts he did not consider them as negotiations. "We still have a very big gap," said Yassin Noman, the rotating head of Yemen's opposition coalition. "I think he (Saleh) is maneuvering." Yemeni political sources said some issues that could hold up a deal were whether the opposition would give guarantees not to pursue Saleh and his family legally. Saleh opponents also want to be sure his close relatives leave positions of power. "I hope it (agreement) will be today, before tomorrow," Qirbi told Reuters in an interview, adding that the time frame of a transfer of power could be negotiated. Saleh, who oversaw the 1990 unification of north and south Yemen and emerged victorious from a civil war four years later, told tribes in Sanaa on Saturday that he would "work to avoid bloodshed using all possible means." "President Saleh is willing to look at all possibilities, as long as there are really serious commitments by the JMP (opposition) to come and initiate a serious dialogue between them and the ruling party," Qirbi said. But an opposition leader cast doubt on prospects for a swift accord and a Sanaa diplomat cautioned it was too soon to discuss an outcome, saying it could "go either way." Qirbi said discussions were focusing on the time frame of a transition, among other issues. "I think the time period is something that can be negotiated. It shouldn't be really an obstacle to reach an agreement." "I think things are very close if the real intention is really to reach an agreement. But if there are parties who want to obstruct it then of course one cannot predict." Saleh, speaking to Arabiya television, confirmed that meetings had taken place in the past two days that included a discussion about a presidential address to parliament. "There was a meeting yesterday and the day before ... to discuss ways to end the crisis," Saleh told Arabiya. Saleh said the U.S. ambassador was present at talks in the past two days and that he would welcome Saudi or Gulf mediation. But he was scathing about the opposition, who he said were mainly socialists and Islamists trying to seize power on the back of the youth protest movement. "They are a minority. They can organize a march of 20,000 people? I can get two or three million. How can a minority twist the arm of the majority?" he said. Saleh has responded to the mass protests with a violent crackdown and a series of concessions, all rebuffed by opposition parties, including one this week to transfer power after the drafting of a new constitution and parliamentary and presidential elections by the end of the year. Western countries are concerned that al Qaeda militants could take advantage of any power vacuum arising from a rocky transition if Saleh, a U.S. and Saudi ally fighting for his political life, steps down after 32 years in office. Washington and Riyadh, Yemen's main financial backer, have long seen Saleh as a bulwark against al Qaeda in the Arabian Peninsula (AQAP), which has tried to stage attacks beyond Yemeni soil since 2009 in both Saudi Arabia and United States. The tide against Saleh appears to have turned after plainclothes snipers loyal to the president fired into an anti-government crowd, killing 52 people on March 17. That led to a series of defections that eroded Saleh's position including by top military commanders such as General Ali Mohsen, as well as ambassadors, lawmakers, provincial governors and tribal leaders, some from his own tribe. Saleh said the defections came mainly from among Islamists of the Muslim Brotherhood and some had returned to his side. He said Mohsen had been acting emotionally because of Friday's bloodshed but that security forces were not behind the deaths. "It was 41 people (who died), I heard. Their identity is unknown ... The Yemenis are snipers, they are all snipers, all trained in weapons," he joked on Al Arabiya. "A group has been arrested. They are being investigated and will face justice." DAMASCUS, Syria – A scenic seaside city echoed with gunfire Saturday as protesters defied government forces in Syria's second day of nationwide unrest, burning tires, attacking businesses and setting the offices of the ruling party aflame. At least two people were killed by rooftop snipers in the religiously mixed Mediterranean city of Latakia, officials said, and President Bashar Assad's government of minority Alawite Muslims blamed a major Sunni cleric in Qatar for inciting the unrest. The government also said demonstrators had attacked a police station and offices of the Baath party in the town of Tafas, six miles (10 kilometers) north of the southern border city of Daraa, the epicenter of more than a week of anti-government protests. Sectarian divisions are a deeply sensitive topic in Syria, where Assad has used increased economic freedom and prosperity to win the allegiance of the prosperous Sunni Muslim merchant classes, while punishing dissenters with arrest, imprisonment and physical abuse. Assad has placed his fellow Alawites, adherents of a mystical offshoot of Shiite Islam, into most positions of power in Syria. He has built a close relationship with Iran, allowing the Shiite powerhouse to extend its influence into Lebanon and the Palestinian territories, where it provides money and weapons to Hamas and Hezbollah militants. The surge of anti-government unrest in the Arab world has until now threatened almost exclusively regimes seen as allies of the U.S. and Western powers. Tunisia, Egypt, Yemen and Bahrain have maintained warm relations with Washington, and even Libya had growing ties with Britain, Italy and the rest of Europe. The unrest in Syria, which exploded nationwide Friday after roiling Daraa for a week, is a new and highly unpredictable element of the Arab Spring, one that could both weaken a foe of the West and cause dangerous instability in one of the more fragile and potentially chaotic countries of the Mideast, experts said. On Friday, Syrian troops and soldiers opened fire in at least six cities, towns and villages, killing some 15 protesters, according to witnesses, activists and footage posted on social networking sites. "We are in for a long, grueling civil conflict," said Aaron David Miller, a former State Department official who worked on Mideast peace negotiations in six U.S. administrations. "The black box in Syria, once you open it up, has some very nasty stuff inside." Dozens of people protested in Latakia before attacking the Baath party's offices in Syria's main Mediterranean port — a tourist draw renowned for its sandy beaches and resorts, said Ammar Qurabi, an exile in Egypt who heads Syria's National Organization for Human Rights. Home to some half a million people, Latakia is a mix of Sunnis in its urban core, Alawites living in villages on the outskirts, and small minorities of Christians, ethnic Turks and other groups. A Syrian activist in touch with protesters in Latakia said hundreds had been demonstrating there since Friday evening, burning tires and shouting "Freedom!" A few protesters were attacking cars and shops, the activist said on condition of anonymity due to the sensitivity of the issue. Syrian presidential adviser Bouthaina Shaaban said Qatar-based Sheik Youssef al-Qaradawi had incited Sunnis to revolt with his sermon in Doha on Friday. Al-Qaradawi, who has millions of followers around the world and is seen as one of most influential voices in Sunni Islam; told his audience that, "Today the train of revolutions arrived at a station that was inevitable it would reach: the station of Syria." "Syria is like the others — and it is more deserving than others of these revolutions," he said. "When there are those who are killed, know that the revolution has been victorious!" Shabaan said those words were responsible for the unrest in Latakia. "There was nothing (in Latakia) before Qaradawi's sermon on Friday," she told reporters in Damascus. "Qaradawi's words were a clear and honest invitation for sectarian strife." Shaaban said that a group of Palestinians had come into Latakia from a refugee camp with weapons and opened fire, killing a policeman and two protesters. "These are not peaceful protests demanding accelerated reforms ... what is happening in Syria now is an attempt to sow civil strife," she said. A resident of Latakia who spoke to The Associated Press from home reported hearing gunfire Saturday evening. A Syrian official told The Associated Press that two passers-by were killed and two others wounded in Latakia by sniper fire from rooftops. He denied that the army had opened fire on protesters. A hospital official in Latakia also said there were two dead and two wounded. He declined to give any other details. Footage on a Facebook site run by Syrian activists showed what it said were the dead and wounded in Latakia. Young men carried one man by his limbs through a street, then another. They laid the second man limp in the street. "It's the military police!" one shouted. Footage from an opposition Syrian news agency uploaded onto YouTube claimed to show another man killed in Latakia. Men screamed, "Oh God! Oh God!" as they laid the body of the young man on the floor, his face smeared with blood and a gaping hole close to his jaw. The authenticity of the footage could not be independently confirmed. During the week of unrest, Syrian authorities have detained two Americans, a Vermont student and a dual U.S.-Egyptian citizen accused of selling photos and videos of demonstrations. The state news agency Sana alleged that the man had confessed to selling the footage to a Colombian woman. He was later identified by relatives as Mohammed Radwan, 32, of Austin, Texas. Radwan's cousin, Nora Shalaby, said she last heard from him on Friday when he tweeted that he was at a mosque in Damascus where security forces were clashing with anti-government protesters. A Vermont man said his 21-year-old son Pathik Root, who had been missing since March 18, has been found to be in Syrian custody. Tom Root said his son, who had been studying Arabic in Damascus, was detained during a demonstration in the capital. He said he believes his son was watching, and not participating, in the demonstration. Assad appeared to be trying to appease demonstrators in mostly Sunni Daraa, pulling back police and soldiers. His government also released hundreds of political prisoners in an attempt to appease demonstrators furious about the violent government crackdown on dissent. A resident told The Associated Press by telephone that more than 1,000 people were holding a silent sit-in the al-Omari mosque, at the center of the protests there. A human rights activist said authorities had released 260 political prisoners in another apparent attempt at appeasement. Abdul-Karim Rihawi, who heads the Syrian Human Rights League, said most of those released on Saturday were Islamists and 14 Kurdish detainees were also let free. ISLAMABAD - After a prolonged lull, the United States Central Intelligence Agency (CIA) has launched a series of covert operations in the rugged Hindu Kush mountains of Pakistan and Afghanistan following strong tip-offs that al-Qaeda leader Osama bin Laden has been criss-crossing the area in the past few weeks for high-profile meetings in militant redoubts. The US has been on Bin Laden's trail ever since he fled Afghanistan when the US invaded the country in 2001 to oust the Taliban, but the 54-year-old with a US$50 million reward on his head has always remained several steps in front. Asia Times Online has learned that decision-makers have put a lot of weight on the information on Bin Laden's movements as it has come from multiple intelligence agencies, in Pakistan, Afghanistan and Saudi Arabia. 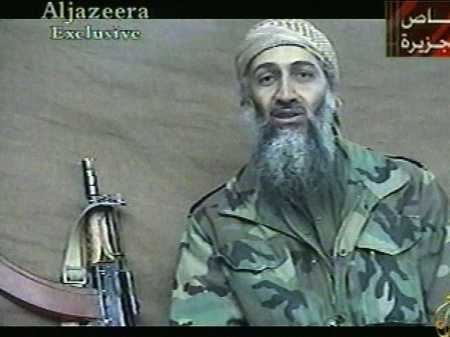 For at least two years, little credible news has emerged of Bin Laden's movements and motives. Now, intelligence officials believe they have top-grade accounts as they come from the inner circles of militant camps. Officials are said to be "stunned" by the visibility of Bin Laden's movements, and their frequency, in a matter of a few weeks in the outlawed terrain of Pakistan and Afghanistan, the most unprecedented reports about him since he evaded the US in the Tora Bora mountains in Afghanistan in 2001. The development has fueled speculation in intelligence circles that al-Qaeda could be planning another major attack along the lines of the September 11, 2001, assault on New York and Washington, and the July 2007 foiled bomb attack in London. However, extensive investigations by Asia Times Online, including exchanges within al-Qaeda's camps, point in another direction: given the nature of Bin Laden's meetings, this appears to be the beginning of a new era for a broader struggle in which al-Qaeda, through its Laskhar al-Zil (Shadow Army), will try to capitalize on the Arab revolts and the Palestinian struggle and also revitalize and redefine its role in Afghanistan. Several weeks ago, Bin Laden is reported to have met with Gulbuddin Hekmatyar, the legendary Afghan mujahid and founder and leader of the Hezb-e-Islami Afghanistan (HIA) political party and paramilitary group, in a militant camp in thick jungle on the fringes of Kunar and Bajaur provinces in Afghanistan. The encounter was publicized by leaks from the HIA's inner circle and the news was circulated within militant camps in Pakistan's North Waziristan tribal area via top-level Pakistani militant commanders in Bajaur. Despite him being an ally in the war in Afghanistan, the Taliban led by Mullah Omar have always been skeptical about Hekmatyar's intentions, while Bin Laden and some other al-Qaeda leaders view him differently. Hekmatyar's representatives of the HIA have been in direct active negotiations with the Americans and have also brokered limited ceasefire agreements with North Atlantic Treaty Organization (NATO) forces in Afghanistan. Bin Laden fought alongside Hekmatyar in the jihad against the Soviets in Afghanistan in the 1980s and they remained in contact during Bin Laden's days in Sudan, where he had settled in 1992. When Bin Laden returned to Afghanistan in the mid-1990s, he stayed in regions that were controlled by warlords loyal to Hekmatyar. Intelligence sources privy to the meeting in Bajaur said Bin Laden could not afford to meet Hekmatyar simply for a dinner party, which was hosted by a Pakistani militant commander of Salafi tendencies and who was a member of the HIA during the Soviet jihad. "The talks appeared to discuss some grand strategy and Osama bin Laden aims to take Gulbuddin Hekmatyar on board, especially as Hekmatyar's commanders have brokered ceasefire agreements with NATO forces in Afghanistan and Hekmatyar's representatives have been negotiating a truce with the Americans," an intelligence source told Asia Times Online. Adding to the view of the importance of Bin Laden's meeting with Hekmatyar is that it took place when the interest of the CIA and its special forces had already been piqued by reports of the al-Qaeda leader's movements in Kunar and Nuristan for meetings with various militant commanders and al-Qaeda bigwigs. Bin Laden would have been aware of the dangers and was obviously prepared to take the risk. While intelligence agencies might be involved in a guessing game about Bin Laden's plans and a possible grand al-Qaeda operation, his movements can be read in the perspective of recent discourse in al-Qaeda circles and a major shift in its policies. International Islamic militancy that had its roots in the decade-long war against the Soviets in the 1980s was broadly divided into two main schools of thought; both considered themselves righteous despite embodying contradictory themes. These were doctrines of armed struggle espoused by Palestinian Sunni Islamic scholar and theologian Dr Abdullah Azzam, and Egyptian ideologue and Bin Laden's deputy, Dr Ayman al-Zawahiri. Azzam preached in favor of defensive jihad by Muslims to help the Afghan mujahideen against the Soviets. He firmly believed in a broader Muslim bloc including Muslim ruling establishments and never supported revolt against Muslim regimes. Despite being Palestinian with Jordanian nationality and a background in the Muslim Brotherhood, Azzam kept himself aloof from the Palestinian revolt against the Jordanian monarchy in September 1970 (called Black September). After Azzam's assassination in Pakistan in 1989, Zawahiri emerged as the main ideologue of Islamic armed opposition. Coming from the same ideological background of the Muslim Brotherhood as Azzam, Zawahiri faced an entirely different world after the end of the Cold War in the early 1990s when, under American instructions, Muslim regimes were intolerant of Islamic militancy. Of the two schools of thought, Azzam's has never been criticized and is respected by all while Zawahiri's has come under heavy fire from mainstream Muslim scholars and intelligentsia. Zawahiri’s adherents had no argument in his defense other than him operating under the law of necessity. A recent ideological discourse within al-Qaeda's ranks shot down Zawahiri's arguments. This was sparked by key al-Qaeda ideologues and commanders such as Sulaiman Abu al-Gaith (see Broadside fired at al-Qaeda leaders Asia Times Online, December 10, 2010) and Saif al-Adel. Adel emphasized that while polarization within the Muslim world was essential after 9/11 to gather strength behind al-Qaeda, nowadays, especially in light of the great Arab revolt, there was a need to switch to Azzam's viewpoint that sees no need for polarization within Muslim-majority states viz-a-viz the Muslim world's confrontation against Western hegemony. After this, al-Qaeda began a new phase with the Muslim Brotherhood and Palestinian groups to revive its old contacts and establish a new nexus for a joint struggle against Western interests in the Muslim world. Bin Laden's meeting with Hekmatyar and other militant commanders in the Hindu Kush can be seen as a part of this new war in which al-Qaeda aims to involve the whole Muslim nation. Hekmatyar's HIA has been a part of al-Qaeda's Laskhar al-Zil, which comprises elite guerrillas. Possibly, al-Qaeda aims to revitalize its operations in Afghanistan, and throughout the world, along with mainstream resistance groups (sons of the soil or Ibnul Balad) and in addition to Islamic political parties. While fears attached to Bin Laden’s unprecedented visibility and movement for a grand al-Qaeda operation cannot completely be dismissed, it is more possible that al-Qaeda will undertake both worldwide terror operations and join forces with mainstream Muslim groups. (AP) SANAA, Yemen (AP) — Yemen's chaos deepened on Monday when people looting a munitions factory set off an accidental explosion that killed at least 78 in an area torn from government control by Islamist militants exploiting the president's rapidly dwindling power. Saleh has cooperated closely with the U.S. in the battle against Yemen's branch of al-Qaida, which has used areas of Yemen long out of state control to launch attacks including the attempt to bomb a Detroit-bound airliner with a bomb sewn into underwear. State control diminished sharply this month as massive demonstrations spiraled in major cities and the government pulled police from many towns, and anti-government protesters in other areas pushed out police and soldiers and set up militias for self-defense. The protesters blame Saleh for mismanagement, repression and the fatal shootings of protesters, and say they will not relent until he goes. On Sunday, armed men whom residents described as religious militants seized the towns of Jaar and al-Husn, a hilltop overlooking them, and the factory that makes Kalashnikov assault rifles, ammunitions and explosives used to build roads in the mountainous southern province of Abyan, where Yemen's al-Qaida branch has been active. Residents offered few details about the militants' identities or broader allegiances. "As the central government continues to erode in Yemen, something will fill the gap," said Christopher Boucek, a Yemen expert at the Carnegie Endowment for International Peace. "Who will thrive in that space ... is something we very much need to be worried about," he said. Factory worker Hakim Mohammed told The Associated Press by telephone that the militants took two armored cars, a tank, several pickup trucks mounted with machine guns and ammunition. Later, dozens of impoverished men, women and children entered the facility and looted anything of valued that remained, including cables, doors and vehicle fuel, he said. Some emptied gunpowder barrels to use for collecting rain water, and others picked through the compound's cafeteria for forgotten bags of flour and sugar, said Mohammed, 28. PESHAWAR, Pakistan – Islamist militants ambushed a convoy of Pakistani troops traveling close to the Afghan border on Monday, killing 11 of them in an unusually bloody attack, a government official said. The dead included a colonel and a captain in the Frontier Corps, a paramilitary unit that is being trained by a small contingent of American special forces soldiers. Khyber government official Iqbal Khan said the convoy was returning from a mission in three vehicles when it was attacked not far from the main northwestern city of Peshawar. He said several of the attackers were killed, but gave no more details. Pakistan's tribal regions close to the Afghan border are home to al-Qaida and Taliban militants seeking to overthrow the U.S.-allied secular government and establish a hard-line Islamic state. The Pakistani army has launched several operations in the remote and rugged region over the last 2 1/2 years, but the insurgents have proved a resilient foe. The army says more than 2,000 Pakistani soldiers have been killed there since 2001. The United States and other Western nations are helping Pakistan because the region is a major global hub for foreign extremists. It is also used as a base to attack Western forces in Afghanistan. DAMASCUS (AFP) – More deadly violence erupted in Syria as snipers killed two people and demonstrators torched an office of the ruling Baath party of President Bashar al-Assad. The violence came on day 12 of dissent in a country renowned for its iron grip on security. Authorities however freed 260 political detainees in a bid to appease increasingly angry protesters, who have put Assad under unprecedented domestic pressure since he came to power in 2000. Officials have confirmed 27 deaths in clashes between demonstrators and security forces -- 20 of them protesters -- in cities including Homs, Sanamen, Daraa and Latakia since the rallies began on March 15. Activists have put the death toll at more than 126, with upwards of 100 killed on Wednesday alone in a bloody crackdown on protests in Daraa, the southern tribal town that has become the symbol of the protests. In Latakia, a port city 350 kilometres (210 miles) northwest of Damascus, two people were killed by sniper fire and two more were wounded, a Syrian official told AFP. In Tafas, south of the capital, angry residents torched a police station and the local headquarters of the Baath party, which has ruled Syria single-handedly for nearly half a century. In nearby Daraa, at the Jordanian border, some 300 bare-chested young men climbed on the rubble of a statue of the late president Hafez al-Assad, Bashar's father, shouting anti-regime slogans, witnesses said. Daraa demonstrators on Friday tore down the statue and burned the home of the governor, who was dismissed after demonstrations against him earlier this month. The Assad government has announced a string of reforms to appease demonstrators, including the possibility of ending an emergency law in place since 1963. But protesters have vowed to keep taking to the streets until their demands for more freedom are met. The authorities have accused "armed gangs" of pushing peaceful rallies into violence. Rights groups on Saturday said the political detainees were freed from the notorious Saydnaya prison, north of Damascus, in the biggest concession by the state yet. "Syrian authorities have freed 260 detainees from Saydnaya prison, mainly Islamists but also including 14 Kurds, in a move that comes as part of the promises authorities made recently to boost freedom in Syria," Abdul Karim Rihawi, head of the Syrian League for the Defence of Human Rights, told AFP. A high-ranking official confirmed the news but would not give a number. Despite a call for massive protests on Saturday, on Facebook group The Syrian Revolution 2011, which has emerged as the motor of the protest movement, the only rallies in Damascus were in support of Assad. Men, women and children were on the city's streets on foot and in cars, blaring horns and chanting support for the ruling regime as they waved Syrian flags and pictures of both Hafez and Bashar al-Assad. Authorities have clamped down on anti-regime protests in the capital, where Assad supporters have taken to the streets nightly to voice their support for the 45-year-old president. AFP reporters have witnessed activists being dragged away by plain-clothes security men after two separate protests at the landmark Omayyed mosque over the past week. The southern governorate of Daraa has emerged as the hub of the protests and has sustained the most casualties as residents repeatedly come out to demonstrate. But fears are rising that the protests could slide into sectarian-based dissent. Access to Daraa has been restricted, and security forces escorted a team of AFP reporters out of the town on Friday. The crackdown in Syria has drawn harsh rebukes from the United Nations, the European Union and the United States. The United Nations High Commissioner for Human Rights warned on Saturday that the violent crackdown risked plunging the country into a "downward spiral" of violence. But Venezuelan President Hugo Chavez on Saturday accused the United States of trying to oust Syria's leader to seize the country's resources. "The attack on Syria has begun..." Chavez said at a political event.